We spent Thanksgiving at Christian's parents' house. Here is Carter's cute place card that my mother-in-law made! Carter had so much fun on Thanksgiving! He kept saying "Happy" for Happy Thanksgiving. So cute! But Friday morning we went to the pediatrician. Carter had pinkeye. It got better pretty quickly with the drops and I did lots of laundry and sanitizing. Luckily no one else got it! A little case of pinkeye didn't stop us decorating the house! He was tree-obsessed. He moved the same ornaments about 27 times each. He just giggled and clapped each time he hung one on a branch! Almost immediately I discovered that most of our ornaments weren't going to work anymore . After the third ornament broke, I closed the box and said it's time to go shopping! 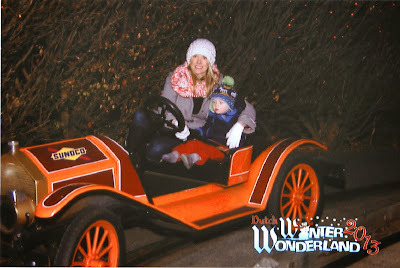 On Sunday we went to Dutch Winter Wonderland with my parents and Ian. The boys were so excited. Carter just kept repeating "rides!" We went on a bunch of rides and saw tons of Christmas lights. It was a little overwhelming, I think and he insisted on being held the whole time. My arms ache today from my 2 hour arm workout! Every time we asked if he liked a ride or was having fun he enthusiastically answered, "yep yep!" It was so wonderful to have this break from school and spend so much fun time with our family! And now it's just a few weeks until Christmas!! Santa, Santa! Ho Ho Ho!